Lymph nodes are the site of filtration in the lymphatic system. Also sometimes incorrectly referred to as lymph glands—they don’t secrete anything, so technically they’re not glands—these bean-shaped sacs are surrounded by connective tissue (and therefore are tough to spot). Lymph nodes contain macrophages, which destroy bacteria, cancer cells, and other matter in the lymph fluid. Lymphocytes (a type of white blood cell), which produce an immune response to microorganisms, also are found in lymph nodes. The indented part of each node, called the hilum, is where the efferent vessels exit and where the blood vessels (that supply the node tissue) enter and exit. 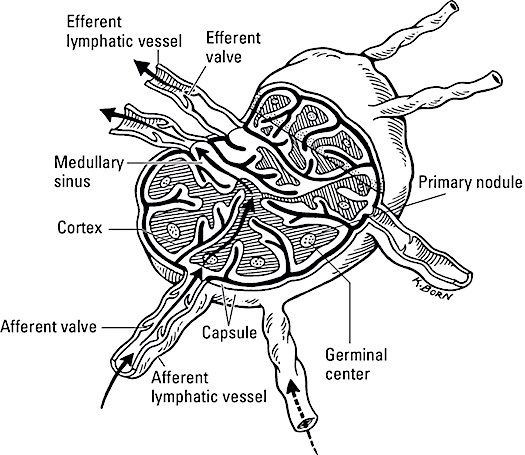 Afferent vessels bring the lymph in on the convex side. The stroma (body) of each node is surrounded by a fibrous capsule that dips into the node to form trabeculae, or septa (thin dividing walls) that divide the node into compartments. Reticular (netlike) fibers are attached to the trabeculae and form a framework for the lymphoid tissue and clusters of macrophages and B lymphocytes called lymphatic nodules. Each node acts like a filter bag filled with a network of thin, perforated sheets of tissue—a bit like cheesecloth—through which lymph must pass before moving on. White blood cells line the sheets of tissue, including several types that play critical roles in the body’s immune defenses. This filtering action explains why, when infection first starts, lymph nodes often swell with the cellular activity of the immune system launching into battle with the invading microorganisms.